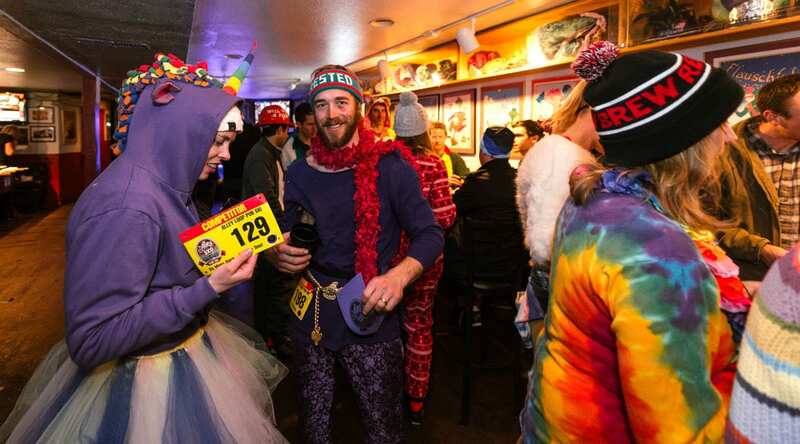 The Alley Loop is not your typical American Birkebeiner Qualifier. The course starts, finishes, and progresses through the heart of downtown Crested Butte, while meandering over snow laden streets, narrow alleys, and one lane bridges. At any given time, you may be cheered on by alley revelers, find yourself surrounded by Oompa Loompa’s, or skiing along side a crazy connected train of costume assemblage… Racers are sometimes forced into making daring passes, and depending on their luck, may even get waylaid on a bridge for a brief moment. Once you make it through town, you are rewarded by pristine tracks and epic views on the surrounding Crested Butte Nordic trail network. If you like normal, you may want to look for another race. If you are up for anything, this is right up your alley! Any skier 30+ years of age racing the Alley Loop in their designated National Master distance is automatically considered a National Masters competitor. Age class awards will be presented in this cordial atmosphere, allowing racers to celebrate the day’s races, while simultaneously preparing for Sunday’s competition. Complimentary Soup and Wine will be served. National Masters racing continues Sunday, February 3rd with a Classic competition! Sunday’s event will recognize the overall best competitor in every official age group at the AXCS National Masters, and will be recognized with U.S. Masters XC Ski Team designation. Depending upon your age classification, you will ski 1 to 3 laps of a modified 3.5 km course ( elevation gain/loss – 617 ft. / lap ) on Ruthie’s Run. Link here to Course Elevation Profile. Study these maps carefully. There are several branching intersection on course. It is your responsibility as a racer to know your race course. Critical intersections are signed and have course marshals. Ultimately, it is the responsibility of the racer to proceed correctly on course. All racers receive a commemorative poster and Alley Loop SWAG on a first come first serve basis at bib pickup. There are awards for age class winners in all categories. All awards are for male and female categories. You must be present to claim prizes. Awards are not mailed. Every finisher awarded with a metal! Limited quantity of SkiGo Wax Service are available on a reservation basis. Reservations can be made through online Race Registration, or by contacting the Nordic Center Front Desk at 970-349-1707. This service is provided by Crested Butte Nordic in partnership with Boulder Nordic Sport. Skis must be dropped off at the Crested Butte Nordic Center on Thursday, or at the very latest – by Noon on Friday. Any skis not received by this time will NOT be serviced. An application of the low fluorocarbon wax of the day. An application of low fluorocarbon graphite with a topcoat of the high fluorocarbon wax of the day. A hydrocarbon base layer, an application of the high fluorocarbon wax of the day, and a top coat of pure fluorocarbon powder. The Pub Ski is a pub crawl on skis! 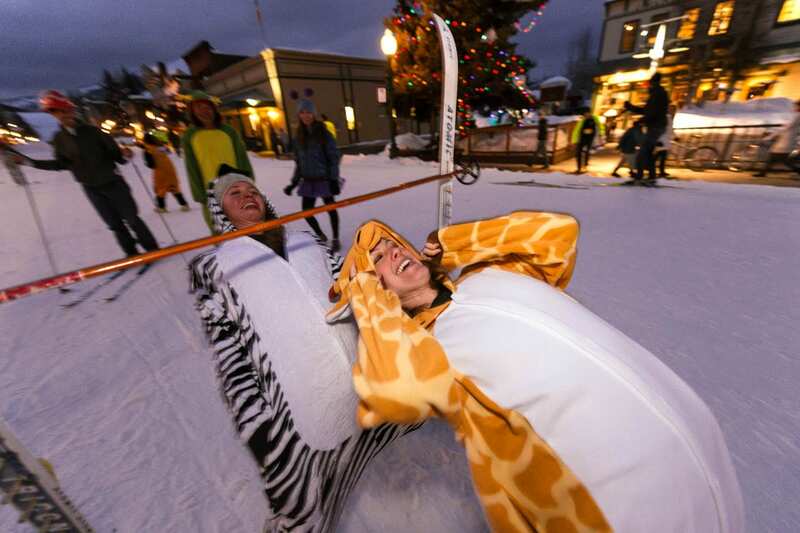 With Crested Butte’s main drag – Elk Avenue, closed down and groomed with snow, competitors ski between participating venues in this novel “ski” competition. You’ll answer trivia, undertake a challenge, or do something plain nutty to earn points on your score card at each bar. Be sure to wear a costume to receive bonus pub points! The highest point earners will be awarded with illustrious Pub Ski Champion prizes. Participant bib pick-up and walk-up registration will take place at Queen of All Saints – Parish Hall, from 3:00 to 4:30 PM. And at the Talk of The Town from 4:30 PM to 5:00 PM. The crawl kicks off at Talk of the Town beginning at 5:00 PM. Pub-ski wraps up at 7:30 PM with an awards presentation at Talk of the Town. Pub Ski participation is limited to 70 competitors…. 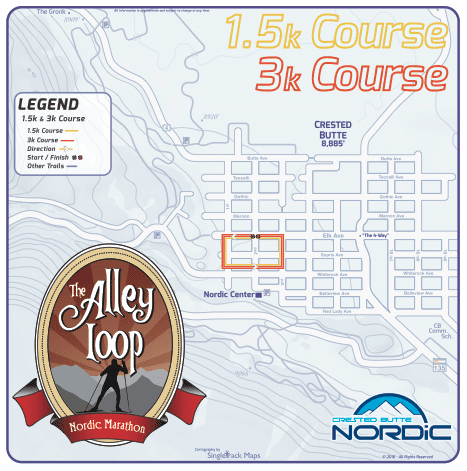 ensure your entry by pre-registering online through Alley Loop Race Registration! This event sells out! Pre-Registration – $25 / Walk-Up Registration – $30. dates/times listed below. 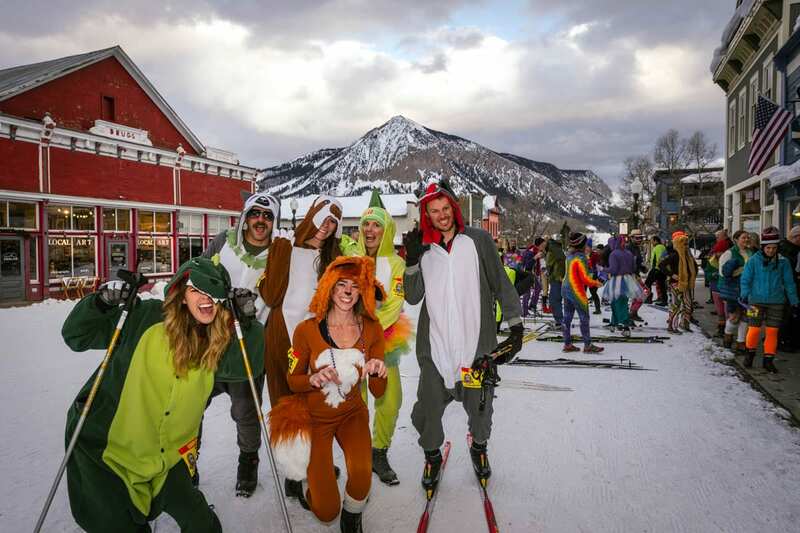 We thank you for your cooperation in accommodating this uniquely Crested Butte event! 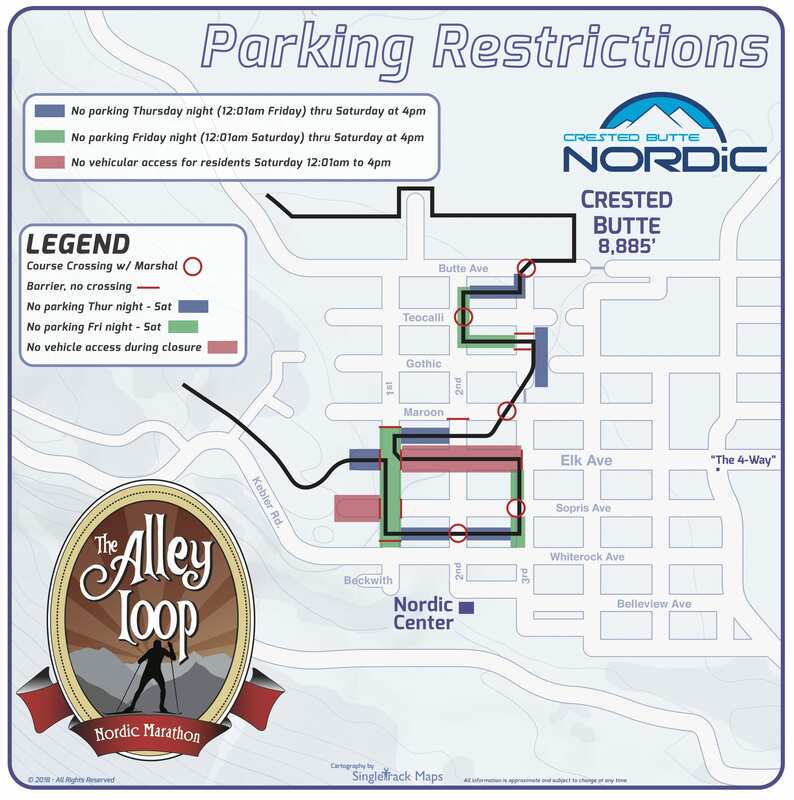 The Alley Loop relies on close to 100 event volunteer’s to pull off this very atypical nordic ski race. To ensure Alley Loop success, we’re seeking Course Marshals, Registration Receptionist, Start & Finish Line Assistants, Pub Ski Operatives, and many more support roles! in addition to a voucher to claim a beer at the finish line expo!